windwarrior had the most liked content! I actually have this one now!! LOL! Turns out I don't have that one anymore. I just realized I sold it and have a different color scheme one now. Forgot I have this one. PM me if interested. 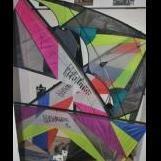 If you're looking for something with some pull, I have a couple of 5 meter kites I'm considering selling. PM me if you're interested. For sale; Micron, Jammin, Hypotist. Kinda the norm for him. It took 2wks since I first responded. So far, no kites. It looks like they never made it to it's next facility per the usps tracking system. Will keep you all posted. Well, so far I bought the Fan&Proph. sent money via PayPal and expecting kites tomorrow. I let him know there was more interests and to update his post. Guess he hasn't yet. I'll chime in once I receive the kites and let you know the results. Who knows, maybe I'll get rocks? I enjoy the heck out of the Micron and stacks!! I'm curious to know if anyone has some of the new Neutrino kites and if ya do, any feedback on it or them? I'm considering buying one and then possibly building a stack. Prophecy, Eclipse(not the total Eclipse)and Fanatic are my interests. I'll wait for pictures and make a decision then. Good night. How about putting prices and conditions on all kites and go from there? I'm interested. Depends on price of course.